It’s cold outside and a warm bowl of porridge does a body good! 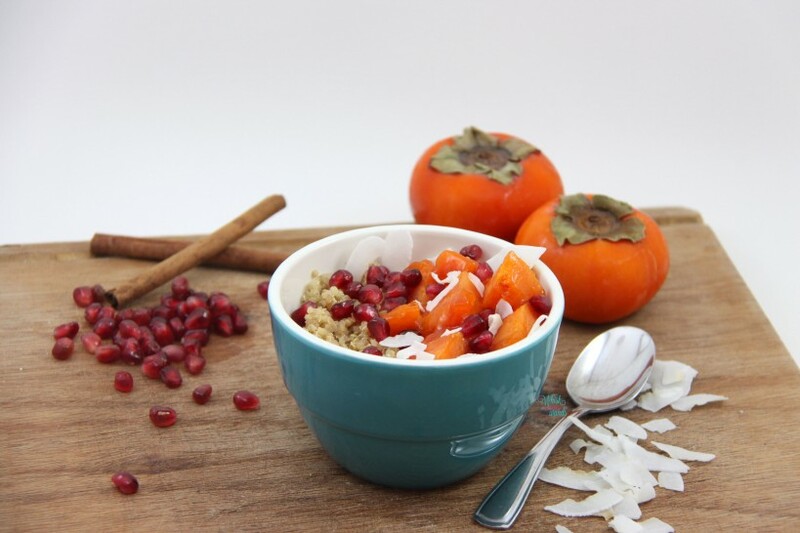 Still craving my Persimmon Cranberry Chia Bowl I decided to warm up some leftover quinoa and make a Persimmon and Pomegranate Quinoa Breakfast Bowl, it hit the spot and was just want I needed! Making it later, which also works great for batch cooking for the week for those batch cook, and making enough for the whole family I cooked a pot of quinoa using coconut milk instead water and adding a little vanilla and cinnamon in while cooking it. This makes it a richer quinoa and almost like a warm bowl of rice pudding. 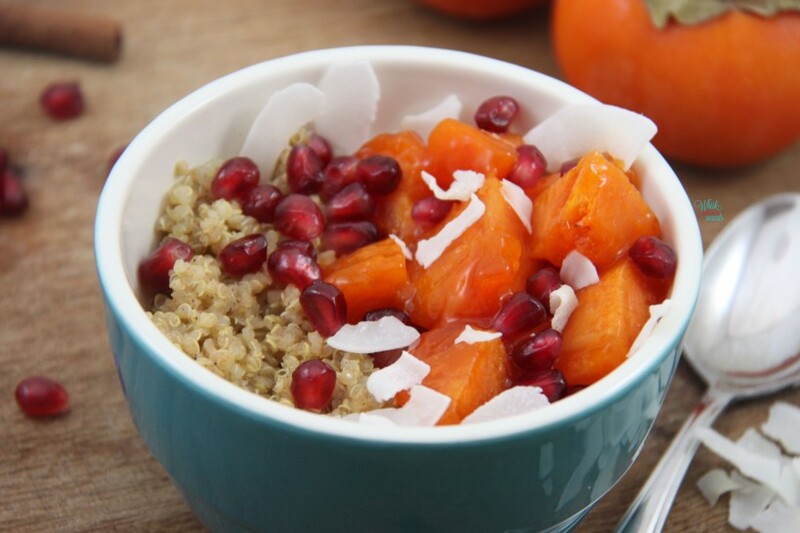 Topping with persimmon, pomegranate, and coconut this quinoa bowl is delicious, healthy, and pretty! I froze some extra persimmon so I can enjoy this past the persimmon season as they aren’t available in stores long here. This can also be enjoyed with cold quinoa and more milk added if desired to suit your personal taste or cravings at the time. *Sometimes I will make a batch of quinoa porridge in the morning or make a batch ahead of time for breakfast. Cooking quinoa in coconut milk with a splash of pure vanilla extract and a dash of cinnamon makes a delicious base for this and a richer taste and texture. If using already prepared quinoa warm if desired, otherwise it can be enjoyed cold. If making quinoa prepare quinoa with either water or coconut milk. In a bowl stir together quinoa, cinnamon, and coconut milk. Coconut flakes can be stirred in or sprinkled on top. 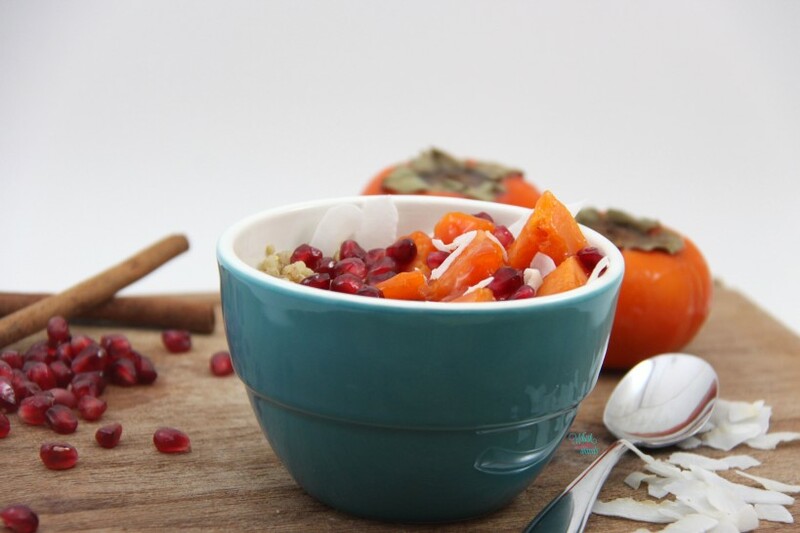 Top with pomegranate, persimmon, and coconut flakes if not already added. Enjoy! Wow that is super creative! I love poms but have never had them for breakfast but why not? !do love quinoa for breakfst. Thanks for linking up with us today again for MM. Have a great day! Thank you! I think any fruit is great for breakfast, you will have to give them a try! Thank you! Bummer you don’t have pomegranates, but cranberries, goji berries, cherries, so many fruits would go great with this! Otherwise I have another persimmon recipe posting later this week without pomegranates that you might like better! I have never cooked with persimmons, and do not know what they taste like, but I bet I would love them. I am really curious! You have the most creative recipes, and I LOVE it! Quinoa for breakfast is amazing, I always forget about it, but need to make it more often! YUM! You will have to try them, I just recently started having them as they weren’t available for sometime. The taste is hard to describe, I often think mangoish but not really. You will have to pick one up and give it a try. I like placing them in the freezer and then pulling them out and eating them frozen or thawed as it usually changes the flavor and don’t care for unripe ones. Quinoa is one I often forget about except for when we have leftovers (which sometimes is often) or when making lots of oatmeals for breakfast to switch things up! This is such a unique recipe! 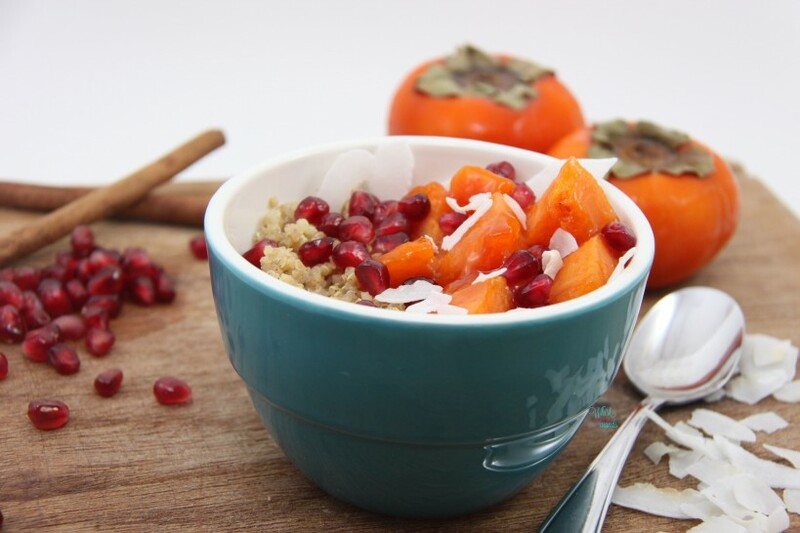 I may have to try it as I’ve never cooked with persimmon! Thank you! I am always happy when one of my recipes inspires someone to try something new!